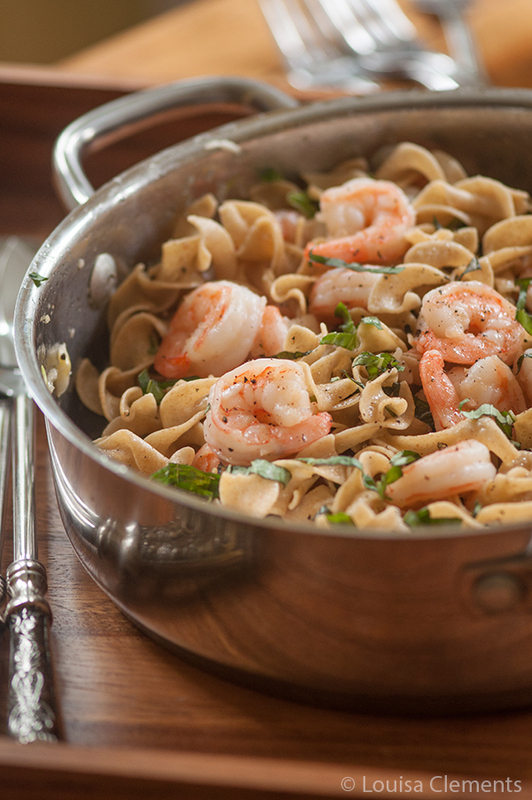 Get dinner on the table with this recipe for pasta with shrimp and basil. Packed with garlic and basil, this butter based sauce is ready in five minutes. This recipe for pasta with shrimp and basil is one of those life saving kinds of recipes. Because let’s be real for a minute here, is there anything better than a quick dinner? I learned from the lovely Ceri of Sweet Potato Chronicles that when you need a fast dinner, eggs will almost always save your life, which is true, but I also think that we should also add shrimp to that list. While shrimp is a little more expensive, try and buy it on sale and store it in the freezer for that night when you just really need a quick dinner. If you’re looking for something easy to make for dinner, and I might be a little biased here, but I think it’s pretty tough to beat this Pasta with Shrimp and Basil. The only prep required is thawing shrimp, crushing garlic and a little chiffonade of basil. (Chiffonade is slicing basil into beautiful ribbons, so easy.) The basil and garlic sauce comes together faster than you can cook your pasta. The first time I had this, my mom had thrown it together for a quick dinner after I came home and announced that I was about to pass out if I didn’t eat something quickly. I tend to do this pretty often, but with me, it’s pretty black and white. I’m never sort of hungry, I’m either starving or too full. Ok, so maybe it’s a little overdramatic, but in that moment, I was starving. 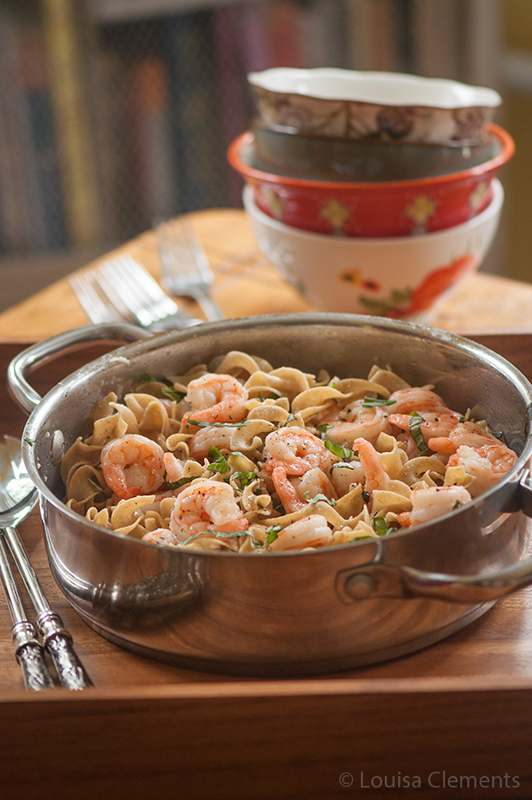 When my mom put a hot steaming bowl on the table, packed with pasta, fresh basil and shrimp, it was honestly one of the best things I had ever smelled. Then I tasted it and it was one of the best things I had ever tasted. I knew right away that this was going on the blog, and a few little tweaks later and here it is. My mom is a pretty talented cook, so there wasn’t much to be done. And yes, if you look at the ingredients list for this recipe you’ll see butter. So yes, this recipe includes butter. But butter makes everything better, it’s true. When it comes to indulging, I think it’s all about moderation. Why avoid putting butter in foods? Instead, just put a little here and there, why not. Live a little. The thing about butter is that it creates a wonderfully rich and decadent sauce, seriously, don’t question the French when it comes to cooking, they know all about butter. For this shrimp and pasta dish, the butter is used for the rich sauce flavoured with garlic and basil. Oh, and did I mention that this sauce is made with five ingredients? Bonus. I wasn’t kidding when I said this pasta with shrimp was an easy weeknight dinner. 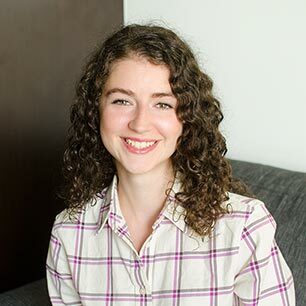 Also, Living Lou is up for the Made in Blog Awards for best Cooking blog- the first round is voted, so if you’d like to head on over and vote for me, I’d love it! You can do so by clicking here. Looking for a fast dinner? This Pasta with Shrimp and Basil will become your new go-to dinner. Meanwhile, in a large pan, heat butter over medium heat. Add garlic, saute until fragrant, about 30 seconds. Add shrimp, cook until pink, about 4 minutes. Stir in cooked pasta, basil and Parmesan cheese. Give this recipe for pasta with shrimp and basil a try and let me know if it saves your life one weeknight. I love shrimp pasta dishes. This looks delish! Thanks, Renee! Shrimp and pasta is a new combination for me - can't believe it took me so long to hop on board. looks easy and tempting! yummy! Hello from sunny Belize .... tried your recipe and LOVED it so much that I served it to my guests and they absolutely LOVED it too ... thanks for the recipe! Hi Kainie, I'm so glad you loved this dish! Thanks for letting me know. Just made this for dinner for the second time, this time over brown basmati rice- equally as good! I found the trick is thoroughly drying the shrimp, otherwise the mix gets too watery! At the last step this time, I also tossed in maybe 16 whole cherry tomatoes. So delicious! Thanks for a great recipe. I'm so glad that you love this recipe, Ali! I love your tips and adding cherry tomatoes sounds delicious. Happy cooking! This was delicious! And, it was so easy. Thanks Barb, so glad you enjoyed it!